Green tea is much lauded for it's health benefits and there is some scientific evidence to back up many of these claims. As a result, its uses are myriad and diverse; from its inclusion in dietary products, to face creams, exponents believe its anti-oxidative and metabolic boosting properties are the secret to a youthful glow and a healthy heart. This is in part, due to its high levels of flavonoids, which can be found in greater quantities in green tea, than in many fruits and vegetables. Flavonoids are thought to help protect against heart disease and some cancers, so it certainly can't do any harm to include a cup or two of green tea in your diet, although levels of these health boosting phytochemicals do vary significantly depending on which teas you drink. I highly recommend you try them all at some point. Just click on the titles to visit the post that features the recipe. It won't have escaped your notice, I'm sure, that all of these cocktails are gin based. There are two reasons for this: one - I just like gin, a lot, and two - the fragrant nature of gin generally combines well with tea and often, if you look at the botanicals that are used in a particular brand, you will be able to make a pretty failsafe combination with a tea that has a similar flavour palate. To begin, and just to prove that I can see past gin on occasion, I've created a cocktail that uses green tea infused vodka. To make this yourself, use a fairly decent vodka to keep the flavour smooth, but there's no need to invest in anything too flashy. For each cocktail you will need 2oz of vodka and 1 tsp of green tea. Flavour will vary according to which tea you use, but that's part of the fun. I used Chun Mee green tea, which amusingly, translates as 'precious eyebrows' (unless Wikipedia is just having a laugh at my expense). Add 1 tsp of green tea leaves to the 2oz vodka and leave to infuse for no more than 1 hour or the flavour will become woody, due to those pesky tannins. Strain the infusion and discard the leaves. Now you are ready to begin. Add the vodka and rosemary to the bottom of a shaker and gently muddle (squish) to release the oils from the herb. Add the lime and elderflower liqueur with a handful of ice and shake until the outside of the shaker has frosted. Strain the contents into a tall glass filled with ice and add a dash of sparkling water to top up. 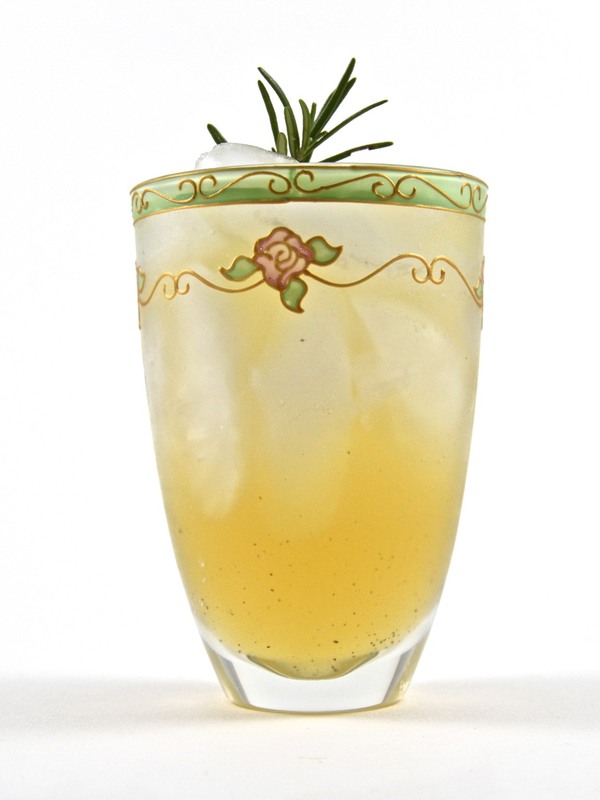 Stir with a swizzle to mix the drink and garnish with a sprig of rosemary. Next up is yet another variation on a classic Mojito, but in place of the sparkling water, I'm using green tea. If you are a fan of the Mojito, I expect you will like this drink, but it's different enough from the original to not seem like a pointless substitution. The addition of green tea gives it a little more bite and a little less sugar, keeps it suitably grown up. Muddle (squish) the mint with the lime juice, in the bottom of your shaker, but don't press too hard or you'll bruise the leaves and end up with the taste of leaf rather than mint. Add the rum and simple syrup with a handful of ice and shake it all for about 20 secs. Strain the cocktail into a chilled, ice filled tumbler and top up with the green tea. Give a stir with a swizzle stick and garnish with a sprig of fresh mint, slapping it gently in your palms to release the minty aroma. This next cocktail is served in the martini style, shaken over ice. The combination of jasmine and elderflower really is quite beautiful and the little kick of green tea keeps it from being too floral. As before, you need to infuse 2oz of spirits with 1 tsp of tea for no more than hour. Jasmine tea can come in many forms, but the one I used combined jasmine flowers with green tea. I would give you the name, but it was all in Chinese as I bought it in an Oriental Minimart. I can however, tell you that the gin was Aldi's own, Oliver Cromwell, London Dry Gin which, for the money is perfectly acceptable, especially for this purpose. 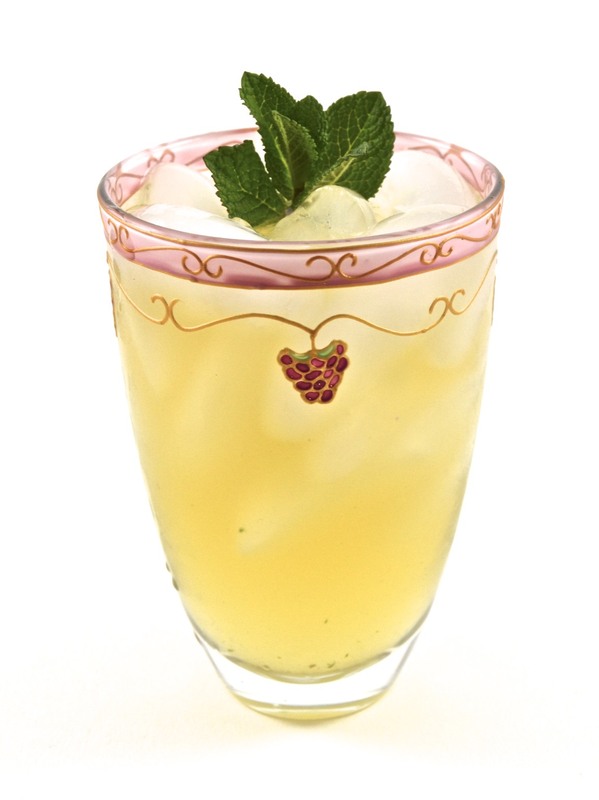 Add the jasmine infused vodka, elderflower and lemon to a shaker with ice and shake hard. 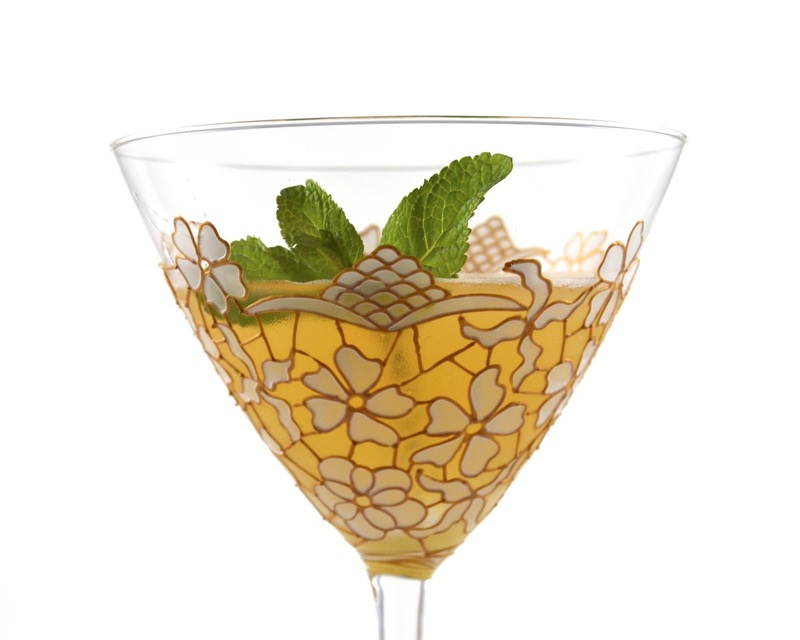 Strain the cocktail into a chilled martini glass and garnish with a sprig of mint. As before, gently slap the mint to release the aroma, before applying as garnish. Last but not least, is a cocktail made with Whittards Chai Tea which is actually a black tea, but combined so beautifully with the gin, I couldn't leave it out. As with the other infusions, use 1 tsp of tea leaves to 2oz gin and infuse for an hour at the most, before straining and discarding the leaves. Add everything apart from the garnish to a shaker, with ice. Shake until the outside of the shaker is frosted and strain into a chilled martini glass. 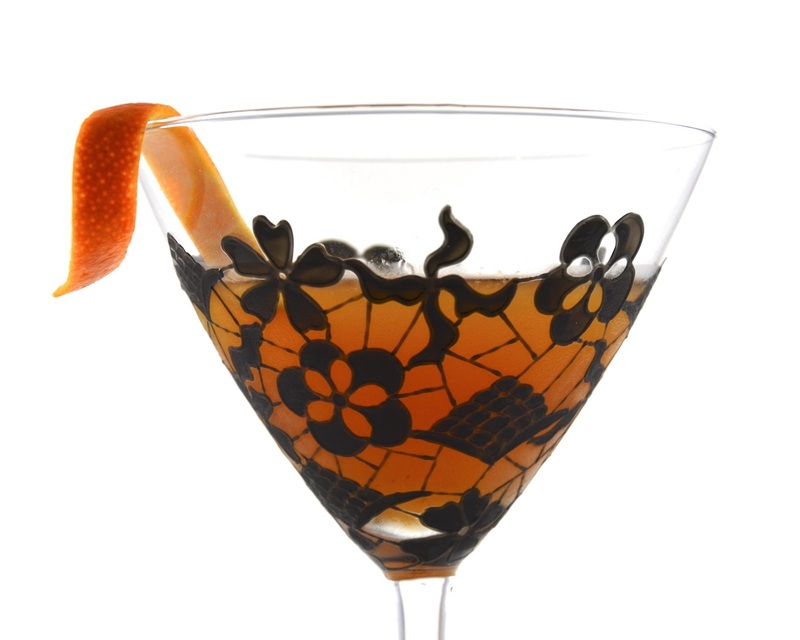 Twist the zest over the cocktail, spraying it with a fine mist of orange oil, and garnish.